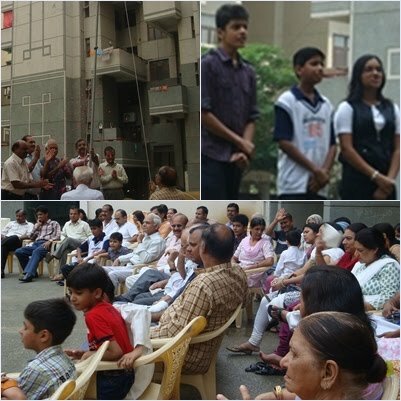 Ashoka Enclave Co-operative group housing society celebrated 64th Independence Day . On this occasion National flag was hoisted by the President of society . 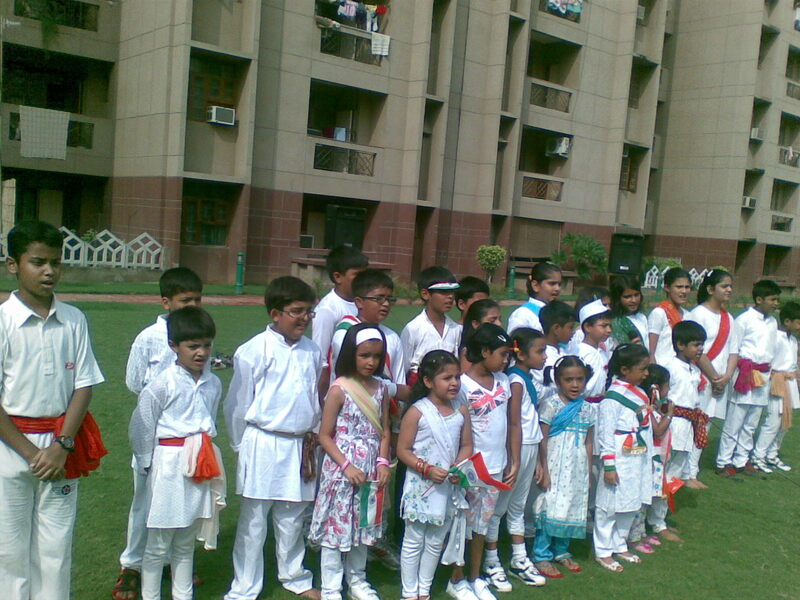 Children of the society made this programme more colorful with their vibrant patriotic songs. Being the new allotment , this was the first occasion when Independence Day was celebrated in the society. Last year on independence day hardly 25 families were shifted in the society . All the member of the society took part in the function and grace the occasion. It was a morning full of celebrations and activities for resident of Sanmati Kunj Apartments. Sharp 9 am the flag hoisting ceremony was held which was followed by singing of patriotic songs by the children and residents of the society. This was followed by the much eagerly awaited inauguration of the COMMUNITY HALL centre of the society by the residents of the society. The community hall was made in a record time of about 45 days from the time the new management committee has been elected in June 2010. This hall is one of the FEW completely Air conditioned hall in DWARKA and is now open to the residents for conducting their functions. The hall has a capacity to accommodate around 100-125 people and is a blessing for the residents. KUDOS to the new management committee. This was then followed by a simple aarti/puja and drawing competition for the children. This year the residents also took the initiative to contribute to the GO GREEN initiative. Around more than 350 plants were planted by the residents and children of the society. If all societies can contribute a little from their side to this GO GREEN initiative then a lot can be achieved to curtail the damage being done by global warming. LAST DATE FOR RECEIPT OF COMMENTS ON TARIFF PETITIONS EXTENDED TO 15TH FEBRUARY 2010.